The other day, I randomly asked Trevor (age 6) how many bones he thought there were in his hand. He glanced at his hand for a second, then made a guess: "5." Without saying a word, I held up my hand and slowly bent my fingers. "Oh! More than 5! Bones don't bend!" He turned his attention to his hand and started counting. Back when I taught 5th grade, one of the topics we covered in science was the skeletal system. To start the unit, I had my students make an educated guess about how many bones there are in the human body. We felt for bones, thought about joints and movement and what they meant regarding bones, and eventually looked at x-rays to confirm our experiments. I was thinking about all of this as Trevor was counting the bones in his hand... and I realized that an x-ray craft would be perfect to help Trevor learn and to cross another letter off our A-Z list. 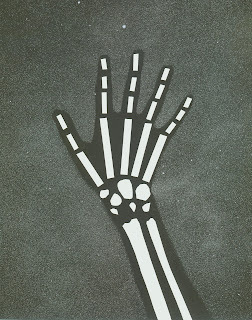 There's a classic preschool x-ray craft where kids use q-tips on black construction paper to make a skeleton. I decided Trevor and I would do a twist on that. We started by tracing our hands onto construction paper, then cutting them out and using temporary adhesive to attach them to black cardstock. Then we lightly misted over the surface using Mister Huey's, which is a wonderful opaque white. I highly recommend it, but you can get a similar look by watering down white paint and putting that in a mini mister. When you remove the hand template, this is what it looks like. While the q-tip projects are cute, I wanted Trevor's to be more realistic, so we used the paper trimmer to cut thin strips of white cardstock. Starting with the fingers, he measured the strip against his hand and made a cut where each bone ended, then glued each piece in place. He was able to feel that there were a few bones in his wrist, but I had to show him x-rays to show that there are actually 8. Here's Trevor's finished x-ray project. One of the small wrist bones is missing, but otherwise it is quite accurate. As you can see, Trevor chose to round off the wrist and arm bones, but left the bones in his fingers with straight edges. Since this was just for fun (and he's only six), that was fine. If I were doing this assignment with 5th graders, I'd have them round off the edges to make them as realistic as possible. So, to answer the original question: there are 19 bones in a human hand, or 27 if you include the wrist! Wow! That is AWESOME!! I loveeeeeeeee it!!! Oh that is so fun!!! I need to do this with my boys! You are the coolest Mom!! What an awesome project!! That's a lot of bones!!! This project is awesome. Trevor is going to be one smart kiddo with all of the neat projects you have him doing. You are an amazing mom, and I bet you were the BEST teacher, too, Cindy! What a wonderful and educational project! Thanks for sharing it with us! You are just TOO GOOD!!! Another WONDERFUL project, Cindy!!! I love the way the teacher in you comes out. Trevor is so lucky to have such a fun and engaged mom like you. Great craft and so educational too. What a fun project. Looks cool and educational. I'm actually thinking about using your craft idea to make a full skeleton for my technical school's door decorating contest! :) My shop area is health occupations so I was trying to find cute door decorating ideas that relate to our technical area so this will work great. Please send me a picture when you're done! I'd LOVE to see it! Well, I've definitely learned something new here. How fun it this project!